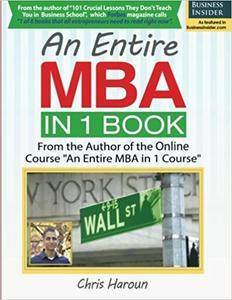 An Entire MBA in 1 Book: From the Author of the Online Course "An Entire MBA in 1 Course"
Chris Haroun, "An Entire MBA in 1 Book: From the Author of the Online Course "An Entire MBA in 1 Course""
This is the book version of Chris Haroun's online course called "An Entire MBA in 1 Course." From the Author of "101 Crucial Lessons They Don't Teach You in Business School", which Forbes magazine calls "1 of 6 books that all entrepreneurs need to read right now." This book will teach you everything you need to know about business….from starting a company to taking it public. Most business books are significantly outdated. This book leverages many online resources and makes the general business, accounting and finance process very easy to understand (and enjoyable too)! There are many incredibly engaging and entertaining video links in the book to YouTube and other sources; ‘edutainment’ works! Although this book is close to 400 pages, I tried to visualize the content of this book as much as possible as this is a more impactful and enjoyable way to learn (think Pinterest versus the tiny words in the Economist)! The contents of this book are all based on my work experience at several firms, including Goldman Sachs, the consulting industry at Accenture, a few companies I have started, the hedge fund industry where I worked at Citadel and most recently, based on my experience at a prominent San Francisco based venture capital firm. I also included many helpful practical business concepts I learned while I did an MBA at Columbia University and a Bachelor of Commerce degree at McGill University. Think of this book as a “greatest hits” business summary from my MBA, undergraduate business degree, work experience in consulting, equities, hedge funds, venture capital and starting my own companies. 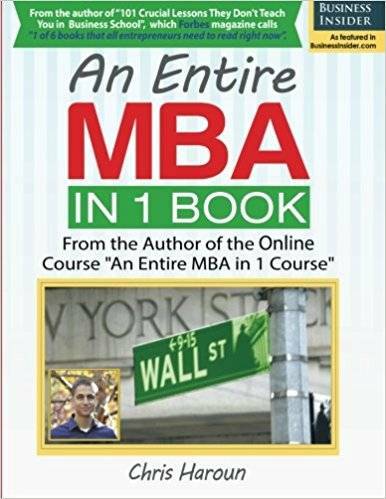 As the title of this book suggests, this is an entire MBA in one book; it’s also a practical manual to help you accomplish your business career goals. I have minimized “boring theoretical concepts” in this book in order to keep it as close to reality as possible. I hope you enjoy it! Thanks!